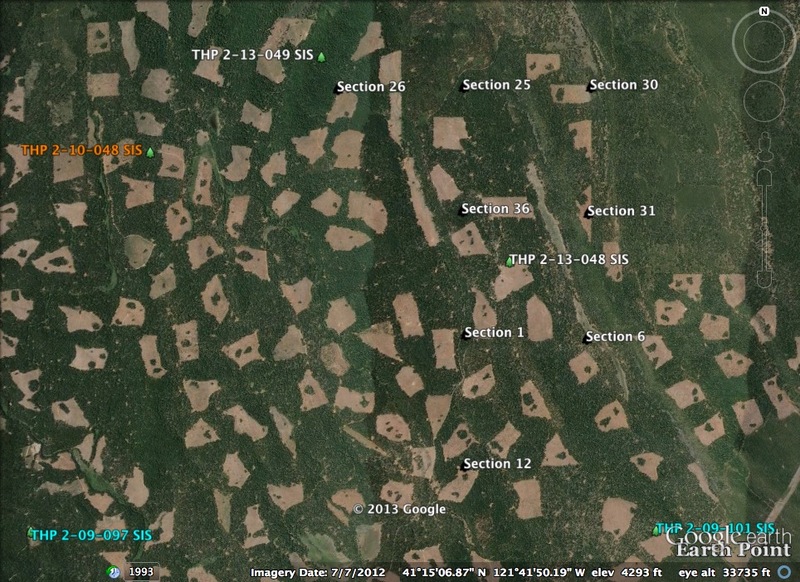 THPBlog: Roseburg Resources Company planning a pair of clearcutting THPs east of Mc Cloud. 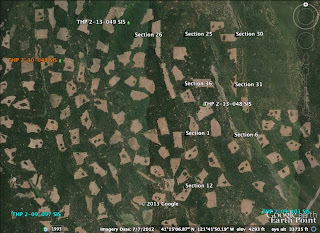 Roseburg Resources Company planning a pair of clearcutting THPs east of Mc Cloud. Both of the THPs listed below are adjacent to each other and drain into Bear Creek which drains into the Fall River and the Pit River above Lake Britton. The area has been heavily clearcut by Roseburg Resources Company in the past, and these THPs will add almost 604 acres of new clearcuts. THP 2-13-048 SIS (Gam THP) Roseburg Resources Company, 423 acres; 98% clearcut, 1% selection, 1% roadside logging. Middle Bear Creek (MD: T39N R2E Sec.1, 12; T39N R3E Sec.6; T40N R2E Sec.25, 36; T40N R3E Sec.30, 31). Winter operations, low erosion hazard, slopes up to 40%, herbicides, goshawk within 1 mi, willow flycatcher near haul road, scattered large trees. Estimated public comment deadline: 10/13/13. This THP is about 2.8 miles north of the town of Pondosa, CA in the Mc Cloud/Mt Shasta region at an elevation of 4,100 to 4,750 feet. Roseburg Resources Company is planning a tractor based clearcut logging operation in second growth Douglas fir, white fir, incense cedar, sugar pine, ponderosa pine and lodgepole pine forest. The THP area drains into Bear Creek which drains into the Fall River and the Pit River above Lake Britton. There is a goshawk territory within 1.5 mi of the THP, and a willow flycatcher population was reported to be located near a haul road at Bear Creek on Pondosa Way. Long haired star tulip was found in the SW corner of Section 36. This THP is just to the SW of Roseburg Resources Company (Paw THP) THP 2-13-049 SIS. THP 2-13-049 SIS (Paw THP) Roseburg Resources Company, 181 acres; 99% clearcut, 1% roadside logging. Middle Bear Creek (MD: T40N R2E Sec.26). Winter operations, moderate erosion hazard, slopes up to 40%, herbicides, goshawk within 1 mi, willow flycatcher near haul road, scattered large trees. Estimated public comment deadline: 10/13/13. This THP is about 4.8 miles north of the town of Pondosa, CA in the Mc Cloud/Mt Shasta region at an elevation of 4,100 to 4,750 feet. Roseburg Resources Company is planning a tractor based clearcut logging operation in second growth Douglas fir, white fir, incense cedar, sugar pine, ponderosa pine and lodgepole pine forest. The THP area drains into Bear Creek which drains into the Fall River and the Pit River above Lake Britton. There is a goshawk territory within .5 mi of the THP, and a willow flycatcher population was reported to be located near a haul road at Bear Creek on Pondosa Way. This THP is just to the NW of Roseburg Resources Company (Pam THP) THP 2-13-048 SIS. More information is available on the THP Tracking Center website.